Cadel Piggott is genius with a knack for systems. He can do just about anything: disable home security systems, hack into government databases and commit credit card fraud. When Cadel gets introduced to a group of genetically enhanced misfits who are determined to take over the world, he finds himself in a world of trouble. Cadel must determine which path he'll choose, how to protect his threatened nearest and dearest, and how to fight genius with genius. With engrossing plots that twist and turn, these highly-awarded, high-tech thrillers are filled with darkness and humour, freaks, geeks and super-villains. "Fiendishly complicated!" my 13-year-old exclaimed with glee, as he quickly started on the second book in the 'Evil Genius' series. Wonderful characters and a deliciously twisting plot, are just two elements that make this series an intriguing and enjoyable read. Despite the vengeful havoc that the young genius can wreck, Cadel's genuine curiosity and natural skepticism mark him for the child he is, while his earnestness and lack of a caring family engender sympathy in the reader. We fear he'll be manipulated by others because of his passion for learning and systems; but Cadel studies people as well as systems - after all, aren't people and their interactions the ultimate of systems? He can't help but admire the bright minds he's up against, but Cadel is desperate to stay one step ahead of them, while we have the satisfaction of watching his character grow and develop. 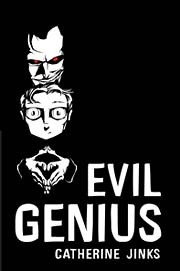 Subtle humor, detailed character descriptions and a novel storyline are marks of Catherine Jinks’ skilled writing, all of which make 'Evil Genius' a series that will appeal to and reward the avid reader.